Created specifically for the needs of Packers and Movers on award winning Zoho Creator, CRM for Packers and Movers delivers outstanding value with an astounding array of features for a fraction of the cost of any comparable industry system. It handles everything that’s required for Packers and Movers to run their business: Capturing leads for Local, Long Distance and International Moves, once the lead is interested – converting the same to Contacts and related Opportunities, Managing Inspections, Preparing awesome Quotes (Hour or Weight-based) and Managing myriads of activities. Categorize Leads by Move Types (Local, Long Distance, International). Track Lead Status (Not Contacted, Interested, Lost Lead, Junk Lead). Once Leads look prospective: Convert them into (A) For Commercial: A Company, Contact and a related Opportunity (B) For Residential: Contact and a related Opportunity. Generate Awesome Looking quote for both Hour-based and Weight-based. Emails are Inside the CRM (powered by Zapier). Tasks, Events, Notes: All in One Place. Company & Contact Reports and Dashboards. You guys are absolutely the best, most talented, and best service oriented company I have ever dealt with. There is not 1 request that has ever been overlooked and each time answered quickly and efficiently. I always get an immediate response which is so uncommon nowadays. We will be doing more business in the future, especially with the CRM.The custom CRM you built has literally changed the way I do business. Following up with my clients is now on Auto-Pilot which has earned me more business and has paid for my system over and over again. Which Edition of Zoho Creator Should I Use? CRM for Packers and Movers is built on the Premium Edition of Zoho Creator. We will deliver you CRM for Packers and Movers within 10 Working Days. How Much Does CRM for Packers and Movers Cost? CRM for Packers and Movers is available at an One-time fee. However you need to pay subscription fee for Zoho Creator. 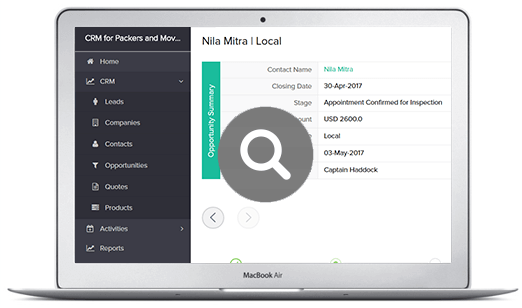 Can I Further Customize CRM for Packers and Movers in Future? es. You can either do it yourself OR hire us at an affordable fee. Can I Have a Demonstration Before I Buy CRM for Packers and Movers? Yes! Of course. You can schedule your session here. Am I Locked with Zoho? No! Never. You are not locked into any long-term contracts. You can pay monthly or yearly, whichever works best for you.